Is there a better alternative to AKVIS SmartMask? Is AKVIS SmartMask really the best app in Image Editing category? Will AKVIS SmartMask work good on macOS 10.13.4? AKVIS SmartMask is an efficient selection tool that saves time and is fun to use. Selection has never been so simple! There are many occasions when you need to target a specific area of an image; image when selecting this area, it is often necessary to highlight a great number of simple regions to which an effect or correction should be applied. Because of this, the creation of photo collages and photo montages can often require an extensive selection of objects. AKVIS SmartMask makes even a difficult selection incredibly simple. Now, you can spend less of your time on selection of objects and more of it on creativity. Added the new Refine Radius tool. Added a number of new settings to the Magic Brush tool (Transition and Priority parameters in the Keep Colors field, Lab Colors check-box). Added the new Gray interface theme. The Dark and Light themes have been improved. AKVIS SmartMask is an efficient selection tool that saves time and is fun to use. Selection has never been so simple! There are many occasions when you need to target a specific area of an image; image when selecting this area, it is often necessary to highlight a great number of simple regions to which an effect or correction should be applied. Because of this, the creation of photo collages and photo montages can often require an extensive selection of objects. AKVIS SmartMask makes even a difficult selection incredibly simple. Now, you can spend less of your time on selection of objects and more of it on creativity. The software provides powerful tools for masking objects on images and removing backgrounds. It can create various selection types, with both soft and sharp edges. It even lets you select fluff, hair, fur, tree branches, glass, or a transparent veil with just a few mouse clicks! The program also allows you to get rid of the unwanted color shades left on the cutout object by the environment. There are two modes of image processing: Auto mode, which offers a powerful algorithm for automatic recognition of areas, and Manual mode, which includes a set of smart and helpful brushes to touch up the results, where needed. Our interface is so intuitive that you will feel like a child drawing in class: there are two pencils in Auto mode - you draw a line with the blue pencil inside the object you want to select (for example, yourself on a group photo), and then use the red pencil to create lines outside the object which define the areas that should be cut out (the other people in the photo). The program then interprets your intentions and intelligently makes the selection you want, understanding where the borders are. With simple images the pencil tools or the Quick Selection tool in manual mode are often enough to produce a professional-looking result. Our Quick Selection tool is a powerful feature which allows our program to select regions automatically with just a few clicks. In cases where the selected object stands against a background of a similar color range, or the object's edges are uneven, you can use the touch-up brushes, like the Magic Brush and Background Eraser. Like all our products, SmartMask is a tool that is not only straightforward, but also fun to use. It makes the dull process of image manipulation a fun and entertaining. Making selections can take a great deal of time out of a designer's work day. For this reason, with AKVIS SmartMask you can considerably increase your productivity! You will be freed from boring work and will have more room for creativity and realization of your ideas. Saving your Work When working with the software, you can save a working draft of your project into an AKVIS file which contains the original image, the state of the image at the moment it was saved with all its parameters and settings, and any manually created checkpoints which where added during your work. This very helpful feature is highly appreciated by professionals. 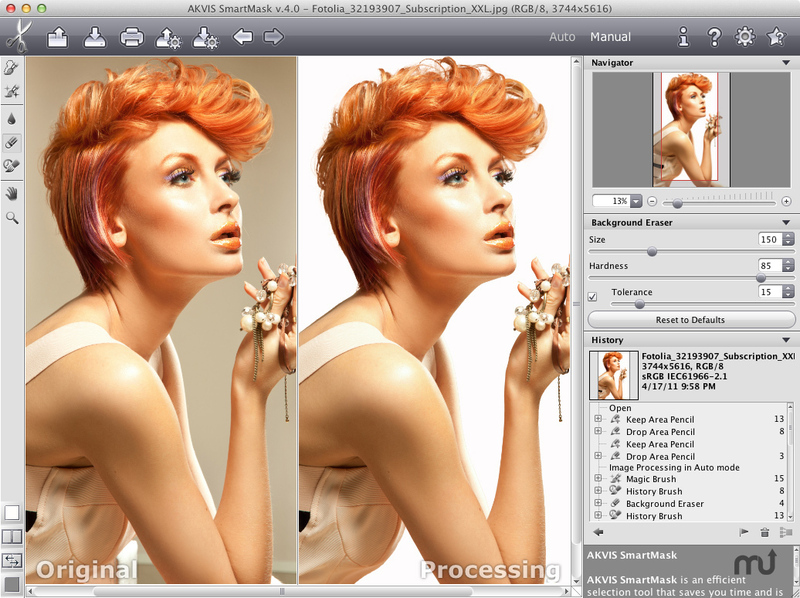 AKVIS SmartMask is available as a standalone program and as a plugin to a photo editor. The plug-in version is compatible with Adobe Photoshop, Photoshop Elements, Corel Paint Shop Pro, and other image editors. SmartMask is available as either a standalone application or as a plug-in, and pricing starts at $69 for home (non-professional) use. Both the standalone application and the plug-in are available together for $90 for non-professional use. Pricing information may be found here.